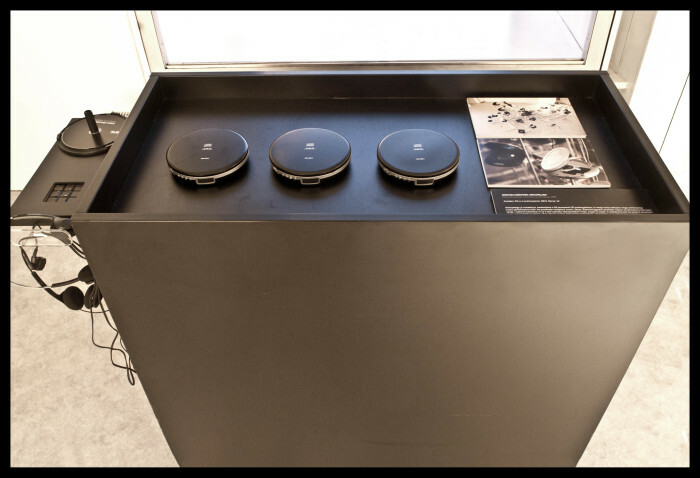 Archipelago is an installation for 53 portable CD players which inverts their normal role as the source of audio, turning them instead into receptors of sound: ears. It was premiered on SONICA Festival 2013 in Ljubljana. Archipelago (Islet) is an edition of 12 CDrs each of which is packaged in a portable CD player, twelve fragments of the whole each containing four tracks which offer different auditory perspectives of the original work. 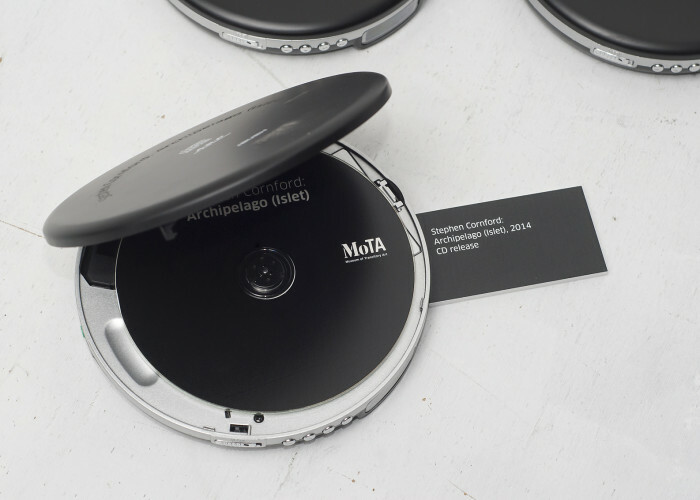 Archipelago is a work for 55 portable CD players which inverts their normal role as the source of audio, turning them instead into receptors of sound: ears. In doing so the installation asks how these machines might behave were they able to hear. Electromagnetic recordings of the machines are played back into their motors, causing them to twitch, tremble and spin unpredictably. These mechanised spasms are then amplified through an array of small speakers encircling them. The abandoned portable stereos of the past, a technology designed to enable solitude and isolation in even the most crowded of spaces, are transformed into a network of nervous electronic eavesdroppers. Visually reminiscent of a model cityscape or biological test laboratory, Archipelago subjects domestic technology to the pressures of urban dwelling. The work of Stephen Cornford stems from an abiding fascination with consumer audio electronics: how these devices that we are sold to consume music and images increasingly frame our engagement with the audio-visual world at large. Reconfiguring these media from the inside, re-imagining their functionality, defying their obsolescence and searching for their intrinsic poetry are for Cornford strategies with which to challenge normative use, social conformity and the myth of technological progress. The work inhabits both gallery and gig, taking the forms of kinetic installation and process-based performance by turns, always searching for situations in which the material; whether solid, spatial or sonic; controls the outcome as much as himself. He is currently a Research Fellow at the Sonic Art Research Unit of Oxford Brookes University, co-directs the annualAudiograft Festival with Paul Whitty. Cornford studied sculpture at the Slade School of Fine Art before completing a Masters in Time-Based Arts Practices at Dartington College of Arts. Recent solo exhibitions include Lydgalleriet (Bergen),Campbell Works (London) and Permanent Gallery (Brighton). His work has been included in a large scale retrospective ofSound Art at ZKM Centre for Media & Art, the Mediations Biennale in Poznan and has been purchased for collections on Germany and Poland.